Julia has been really interested in helping me cook lately. She loves to crack eggs, add ingredients to the bowl or pot, and mix everything. It is fun cooking and baking with her! I have been thinking about these coconut date bars that I have found while browsing the Isa Does It cookbook. The recipe is simple… it requires smooth peanut butter, maple syrup, brown rice syrup, coconut oil, vanilla, a bit of salt, oats, crisp rice cereal, unsweetened coconut, and dates. After looking at the ingredients, I realized that I did not have any crisp rice cereal and brown rice syrup. Purchasing the crisp rice cereal was easy enough. The brown rice syrup on the other hand was not. After visiting the grocery store several times with no luck, I finally asked someone about it. Apparently, Lundberg brown rice syrup, which is the only brown rice syrup that I have ever found around my area, had a factory malfunction, so they have been out of commission. The woman at the grocery store mentioned that it was probably going to be out until the summer. So much for my bars! But she also mentioned that a substitute exists… Lyle’s Golden Syrup. Luckily I was able to locate it in the grocery store, so I was now ready to bake the bars. I asked Julia if she wanted to help me make them and she agreed. We mixed everything together and added the batter to a lined baking pan. I pressed it pretty firmly per the recipe and placed it in the oven. The bars were pretty good! I did find them a bit sweet. I wondered if it was due to my brown rice syrup substitute. The recipe required 1/3 cup of brown rice syrup and 1/3 cup of maple syrup. I will have to try them again once I can find the brown rice syrup. Or I wonder if I can cut the sugar a bit… maybe to a 1/4 cup each. I also found the bars to be flaky. For some reason I was expecting them to be firmer, similar to a rice crispy bar but maybe not quite as firm. The coconut flakes that I used were not finely shredded… I wonder if that was the culprit. Although, the recipe does not require finely shredded, so maybe not. Lastly, I think that next time I will add a bit more peanut butter. I did not taste it too much and I think that it will be a good change. Nevertheless, we enjoyed the bars! I have been cooking a lot of pasta lately. Julia tends to prefer it over rice. In an effort to have something different, I decided to make a rice dish. I needed some kind of a sauce, so after searching in a few of my cookbooks, I came across the Peanut Dragon Dressing recipe in the Isa Does It cookbook. It seemed super simple and I pretty much had all of the ingredients. I do have another peanut sauce recipe that I really like and I have it made many times… it is the Peanut Sesame Noodle from SmittenKitchen, but that requires fresh ginger, which I did not have at the time. I suppose that I could have just omitted the ginger from the recipe, but I was kind of excited about this new recipe. As I mentioned, the recipe is super simple… it requires smooth peanut butter, garlic, some water, rice vinegar, soy sauce/tamari, agave, sriracha, sesame oil, and some salt. I did not have agave so I decided to use maple syrup instead. Also, I did not use the sriracha, since Julia tends not to prefer spicy foods and I used garlic salt, since I do not care for raw garlic. The recipe also mentions to blend all of the ingredients in a food processor or blender… I did that the first time that I made it (I used a food processor) and it made a royal mess. It was liquidy enough that it oozed all over my counter. A blender would have definitely been better. I no longer do that. I simply whisk it and it is just as good. I love this sauce since it is so versatile and easy. The dish is now part of my weekly routine. I have served it over rice (I love jasmine rice!) and topped it with any vegetables that I have on hand… grilled/steamed broccoli, steamed carrots, avocado, steamed green beans, grilled zucchini, fresh tomatoes… the possibilities are endless! I have also topped it with some grilled chicken and some peanuts. Using some sautéed/grilled shrimp and tofu would work just as well. The first time that I made it, it turned out a bit thick, so I have been playing a bit with its thickness… I added a bit more water to it the second time that I made it and it worked out well. It does thicken even more if you store it in the refrigerator, but of course you can thin it with a little more water before serving it. I recently ran my longest distance… 8.4 miles. On June 10, I raced in the Mendon Mauler Trail Run. I was very excited to run it. The previous week I ended up running almost 8 miles, so I knew that I was ready. 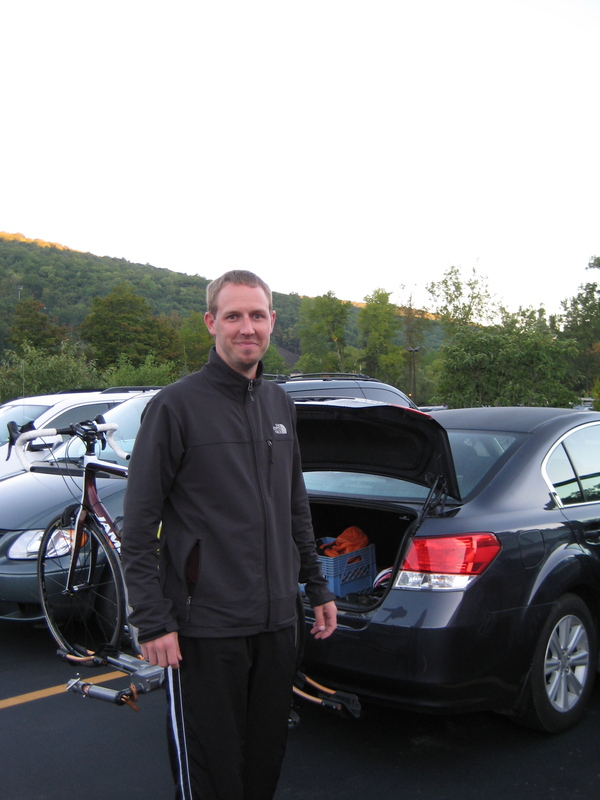 The run took place in Mendon Ponds Park, which was familiar… I ran in there plenty of times, so I knew what to expect. Since I signed up for the 8 miler, it meant that I had to run the same loop twice. That was a bit challenging, since there were a bunch of runners who were doing just the 4 miler and they were running pretty fast. I realized that I am definitely an inexperienced racer. I think that I started a bit too fast since I wanted to stay with the crowd. After about a mile, I calmed down and just ran my pace. I felt great on the fist loop. I took a gel towards the end of the first loop, hoping that it would keep my energy going. I saw Joel and Julia at the end of the loop, which made me smile! Then about a mile into the second loop, my left foot started to cramp. I was very thirsty during the entire run, not sure why. It was also a fairly warm evening. I tried to conserve my water since I knew that I had 8 miles to run and I figured that the 10 oz bottle would be plenty for the run. Apparently not. Then my second foot cramped too. I actually had to stop running to alleviate the cramps. I was so mad at myself for not refilling my bottle at the end of the 4 mile loop. I knew that there was a water station further down the trail but I could not remember exactly where it was. The cramps eased up a bit so I started to run slowly. Luckily the water station came sooner than I thought, so I refilled. I started to feel better… perhaps the gel kicked in and the fresh water helped too. I was running next to this woman and she mentioned that we had about a mile left. When I heard that, I just took off and ran as fast as I could. I felt amazing! I finished strong, but right as I got close to the finish line, my shin started to cramp. Ugh! I was happy with my run considering how I felt. Since it was getting late and close to Julia’s bedtime, we did not hang around much. Once I got home, I decided to check the results. I was amazed and beside myself… I won my age group (1st out of 9), got second in the female group (2nd out of 34), and placed 21 overall (21st out of 71). That’s crazy!! I never would have thought or expected it! My average pace was 12:24, which was a bit slow. I blame my cramps and this steep, full of rocks hill that I had to descend twice. Ha! And I definitely learned my lesson about drinking enough fluids. 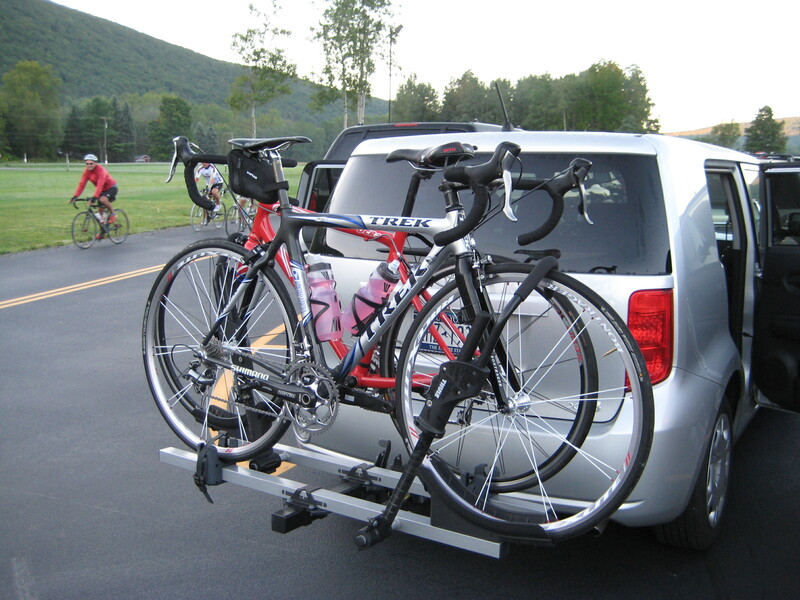 I should have known better since I had the same experiences when I first started cycling. It was also a Friday night… Friday nights are hard due to working all week, taking care of an almost 4 year old, and blah blah blah. Ha! I am still amazed that I can actually run that distance. I guess that I felt the same way when I first started cycling. 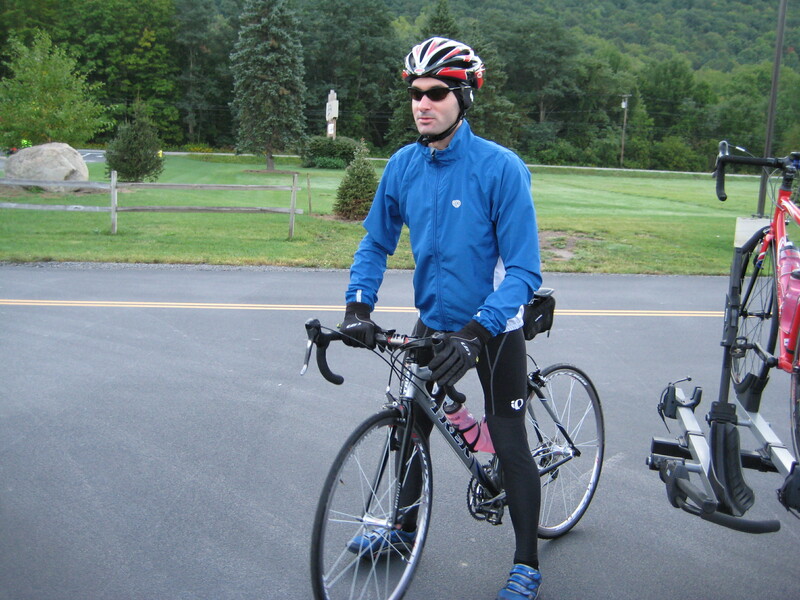 I never imagined riding 15 miles, 50 miles, or even 100 miles… but it happened. For some reason I have no desire to run longer though. I like the 8 mile/10k distance. I also do not have time to train for longer distances. For this race, I ran twice and rode my bike once a week. I can definitely keep that up. Oh and the best part about the race was the prize… a jar of Once and Again Peanut Butter! That’s right! Oh and this log… haha!! Yes, I did it again. I once again signed up to do the Highlander Cycle Tour ride. As my alarm was going off at 5:00 in the morning last Saturday, I was thinking to myself “Why did I sign up to do this ride again!!”. I did have two good reasons. This year I did not have to work hard to recruit people to ride with. 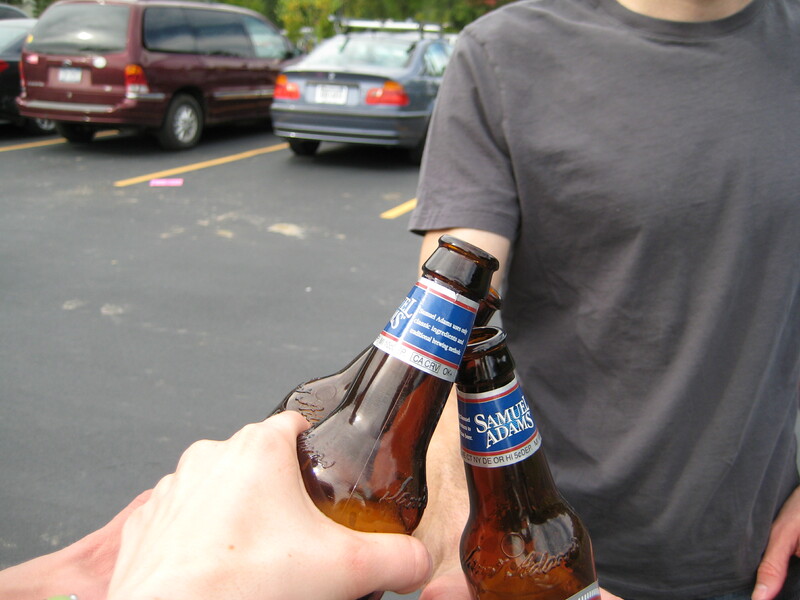 My friend Dan mentioned that he and a few of his friends were going to do the ride, so I was set. Also, the day before the ride, the forecast predicted sunny skies and mid 70s. There were a couple of caveats though. The temperature was going to be in the mid 40s at the start of the ride. I was not very happy about that. And, the fact that I had to be in the Bristol Mountain parking lot at 6:30 am did not make me very happy either. I did try to talk Dan and his friends into starting the ride later, but they did not budge. Joel bundled up and ready to go. Joel and I arrived in the Bristol Mountain parking lot at 6:30 am sharp. We met up with Dan, who was not too happy about the 6:30 am meeting time either. He lives on the west side, so his drive was a bit long. Dan at the start of the ride. Once we bundled up, the rest of the gang met us, we snapped a group photo, and off we went. We took a right out of the parking lot; right on Route 34; left on Route 33; a couple of turns and then on to Gulick; up on French Hill (Ugh! This was one of the steepest climbs on the route. ); south towards Wayland on 36 to 92 to 21, which took us to Neils Creek (I love this road!! ); east on Route 7 towards Prattsburg; down on Itally Hill Rd into Branchport (One of the best downhills!! Much better than going up it. 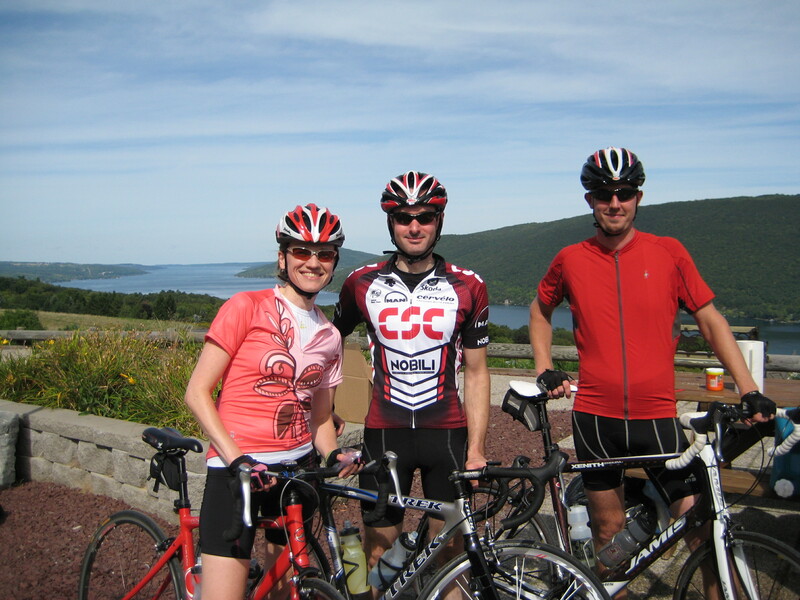 ); made a loop in Keuka Lake’s bluff (Loved the view!! ); north on 28 to 31 to 364 towards Middlesex; south on West Ave to 245 into Naples; up Route 12 (Yes, again!! Ugh! I say it every year… is it really necessary! ); left on 64 and back into the Bristol Mountain parking lot. In the end, my bike computer showed 102 miles. Joel and I at the rest stop in Prattsburg. I really loved the route this year! It was super scenic and beautiful. Also, 90% of the roads did not have very much traffic on them, so it was a very civilized ride. No car fumes and angry drivers this time!! A few of my favorite roads were Route 34, West Hollow Rd/Route 33, Gulick Rd, Neils Creek Rd/Route 6, Prattsburg-Itally Hill Rd, and the roads in Keuka Lake’s bluff. 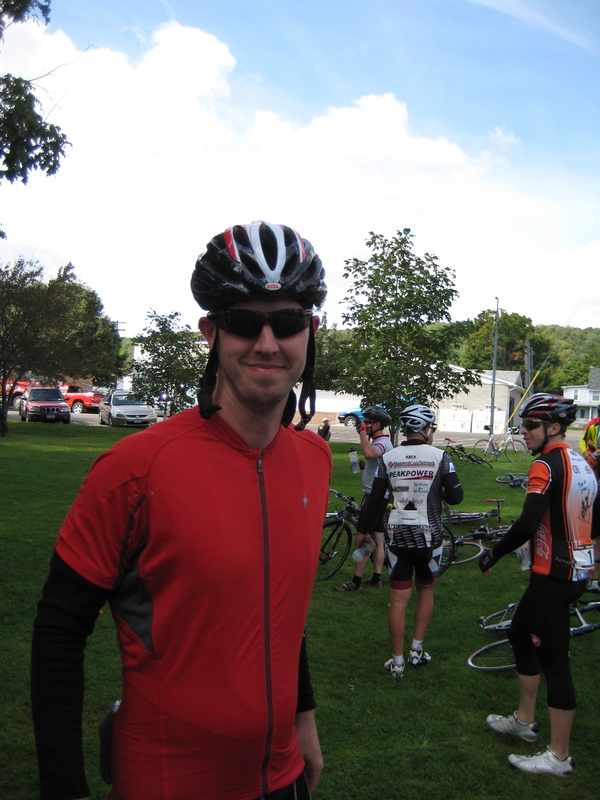 Dan at the rest stop in Prattsburg. As we were riding on Route 34, which was one of the first roads that we rode on, we noticed a house that had steam rising off of its roof. Also, the sun was out, which made the steam look even more dramatic. It was so pretty! West Hollow Rd has always been a favorite. It is located in the valley of Gannett Hill, so it is very scenic. Neils Creek Rd/Route 6 was part of last year’s route, so I was very happy that it was once again on the route. It is such a beautiful road. It reminds me of the Adirondacks. And lastly, Keuka Lake is by far one of the most beautiful places in the Finger Lakes. I always look forward to riding around there. Overall, the ride was good. I really enjoyed the company. The boys were really nice to me, and allowed me to draft behind them. :) The worst part about the ride was the fact that a few of the rest stops had only one Porta-Potty. The bathroom lines were long, which caused our rest stops to be long. That is not a good thing when riding. It makes it difficult to get back on the bike. 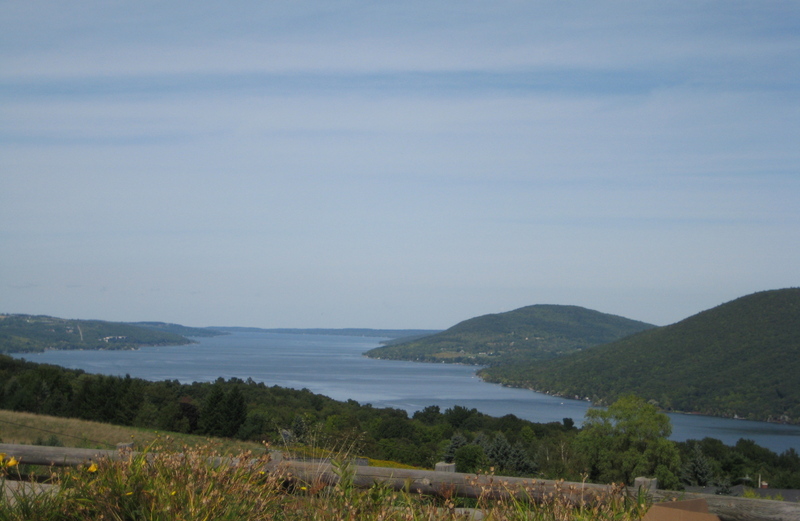 View of Canandaigua Lake from the top of Route 12.